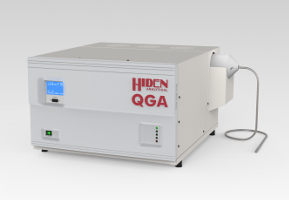 The Hiden QGA quantitative gas analysis system is configured for continuous analysis of gases and vapours at pressures near atmosphere in standard form. Inlet accessories are available to configure the system for sampling from low to high pressures, up to 30bar. The Hiden QIC (quartz inert capillary) sampling interface samples from 100mbar to 2 bar gauge and is included as standard. Operating to 200oC, the QIC flexible 2m capillary inlet provides fast response times of less than 300 millisecond for most common gases and vapours, including water and organic vapours. Optimum sample integrity is maintained with sample exposure restricted to just quartz and platinum wetted surfaces. The QGA system connects to an external dry scroll pump that is included to provide high performance combined sample bypass and UHV foreline pumping. The QGA system has mass range 200 amu (300 amu option) and with a detection capability from 100% to less than 100 parts-per-billion. The system is supplied with QGA Professional and MASsoft Professional software.